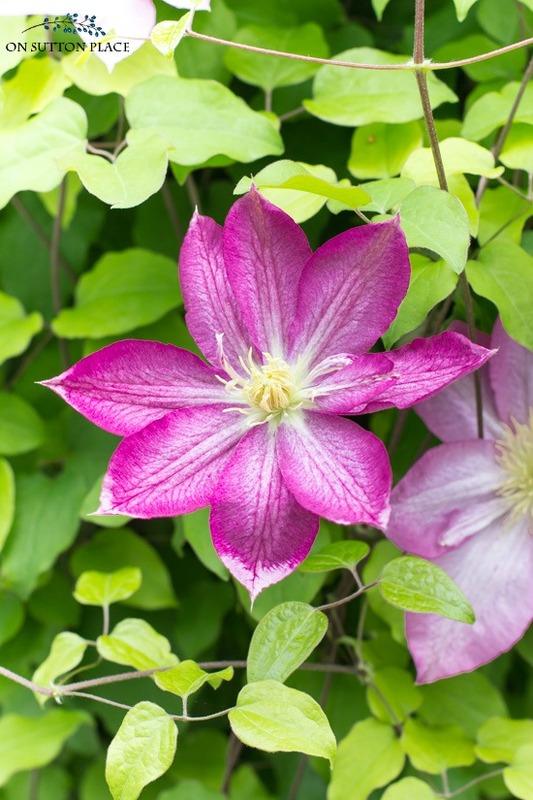 Easy clematis vine growing tips & care advice. 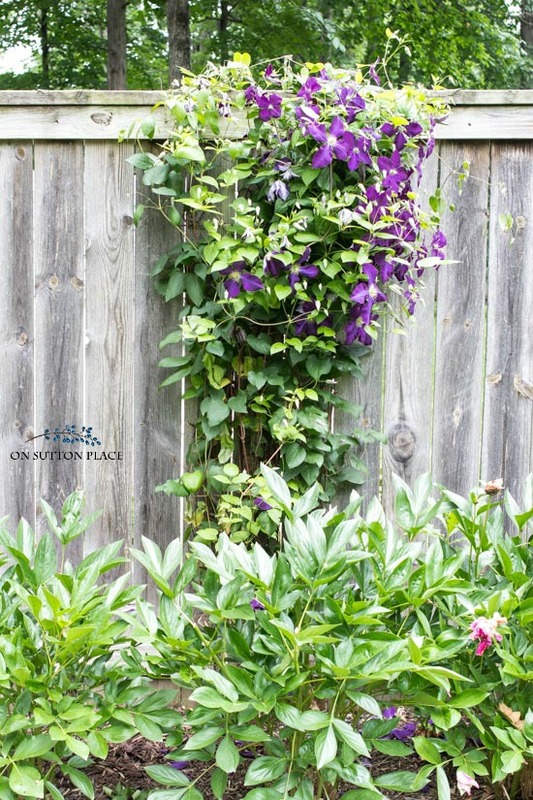 Grow a clematis plant along a fence, on a plant trells or around a light post. 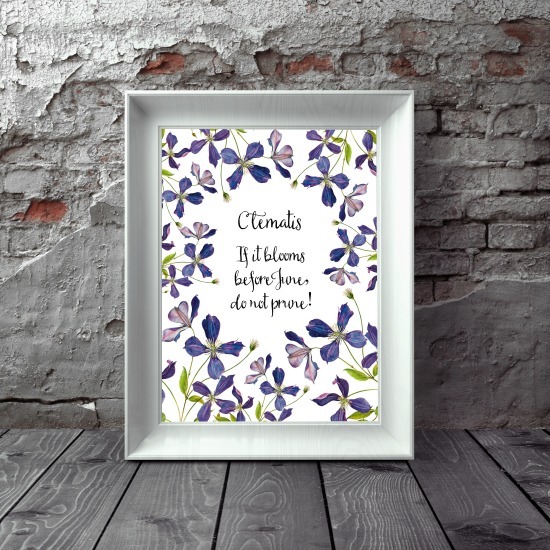 The clematis flower comes in an amazing array of bright colors! 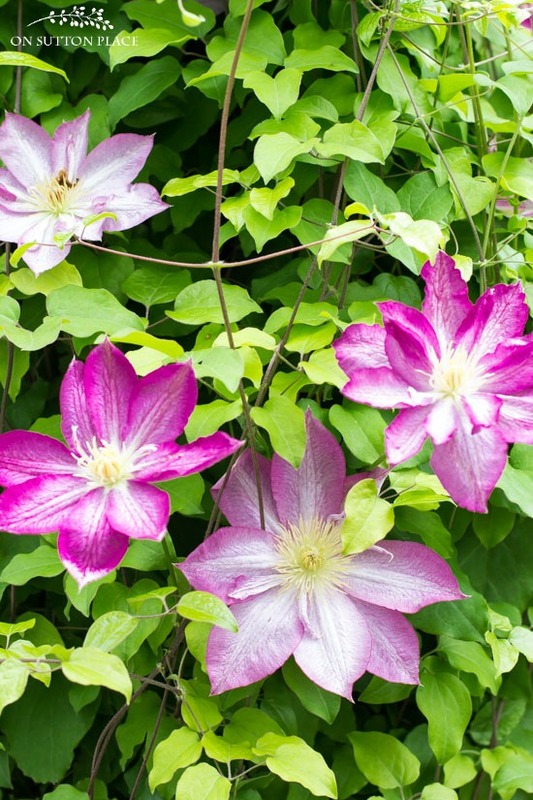 One of the confusing things about the show-stopping perennial clematis vine, and in my opinion there are a few, is the way the word is pronounced. KLEM-ah-tis is the Martha Stewart preferred pronunciation with the accent on the first syllable. kle-MAT-is, with the accent on the second syllable, is the way we say it here in Ohio. No matter how you happen to pronounce it, the clematis plant is a dependable and hardy perennial. I actually have 2 plants of my own. One is in the front yard around my light post (pictured above) and the other is in the backyard growing on my neighbor’s fence (pictured below.) The purple variety on the fence is called ‘Viola.’ I also enjoy my neighbor’s sweet autumn variety which she throws over the fence so it cascades over on my side. So I mentioned confusing things. I planted the variety ‘Kakio’ (the pink one) around my light post in spring of 2010. That following winter was horrible and in the spring of 2011 I was sure the clematis plant was dead. Then all of a sudden, almost overnight, green started popping out on the brown, brittle vines. The buds start to appear after the leaves. I would have never thought something so lovely could come from a what looked like a pile of sticks! Although the roots like to be cool, the vines needs at least six hours of sun per day to fully bloom. Mulch around the base of the plant and water weekly for the first year. After that, the plant should thrive and bloom. 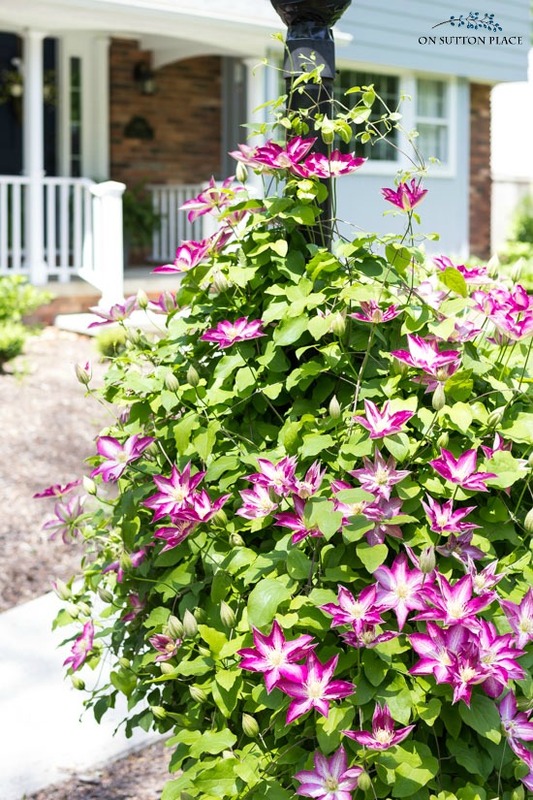 Sometimes referred to as the “Queen of Vines,” clematis can grow high and wide with masses of huge, colorful blooms. Now about pruning, which is another confusing thing. Two years ago I made a mistake and cut the pink plant back in the fall. The next spring, which was in 2014, I had abundant leaves but just a few blooms. Clearly I pruned at the wrong time. 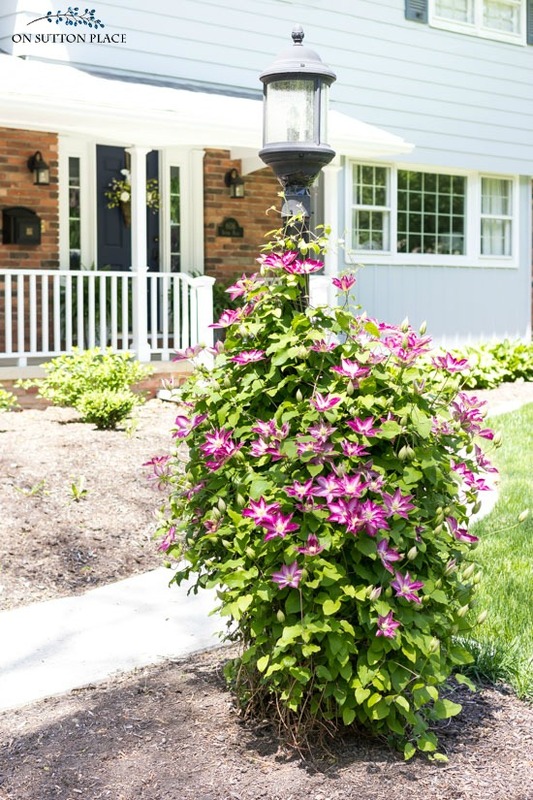 The key to proper clematis pruning is knowing when your plant blooms. For much more information on this subject, click here: Garden Pruning Guide. If you have never tried growing clematis, I highly recommend it. It won’t do much the first season that it’s planted but after that, with very little maintenance, you will be rewarded with blooms that will take your breath away. I just wish they lasted all summer! My favorite clematis is “rebecca” and she starts out red. It took me a long time to find a red one but persistence pays off. Your site is so full of ideas it’s like brainstorming for 1. Thank you. I fave forgotten what the password for the members only library is and have looked thru my emails. Can u tell me where to find it? I have grown them for years! I tried to grow a particular white variety(of course the name eludes me)but with no success. And as far as pruning I never get a chance. My dreaded rabbits eat them to the ground every winter but thankfully they come up every year! They are definetly worth growing. Thanks once again for timely and informative information! I have long admired clematis in other gardens, but have never had one in mine. Maybe this will be the year that I will go on that adventure! Yours is very lovely. Ann I really enjoyed your post on Clematis. I’m a fellow Ohioan. I am about 30 miles north of Cincinnati.. I want to tell you about a clematis i have had for 30=40 years! Yes the same plant. It is the Betty Corning ! I LOVE it. I got it years ago from Wayside Gardens it is so different from regular blooms. It’s blooms are little bells. They are so beautiful and it has survived these cold frigid winters and heat and drought and comes back faithfully every year! Do check it out! Thank you also for the really pretty monthly phone wallpapers. I love them. Looks beautiful around your light pole. I’m so glad you’ll be posting about gardening. Some of my favorite pins on Pinterest are from you.